U.S. field production of crude oil increased in 2015 for the seventh consecutive year, reaching 9.42 million barrels per day (b/d). This was the highest crude oil production level since 1972, based on final production numbers in EIA’s Petroleum Supply Annual. In 2015, production gains were highest in Texas, the Gulf of Mexico, and North Dakota, as these three regions accounted for 77% of the U.S. total increase. 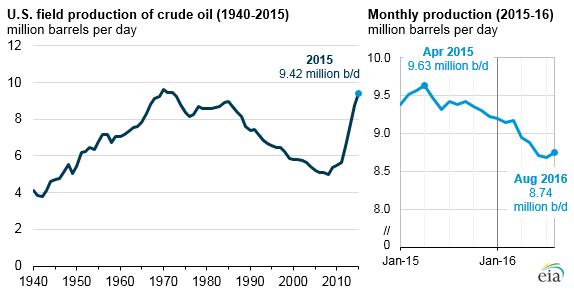 Although annual production for 2015 grew, monthly U.S. crude oil production has declined since April 2015. Lower oil prices led to slower development activity, and production fell to 8.74 million b/d in August 2016, the latest month for which survey data is available. States or areas with the highest volumes of production also saw the largest gains in 2015. Texas is by far the largest crude oil-producing state, providing 3.46 million b/d in 2015, the highest level since at least 1981, when EIA’s state-level production series begin. 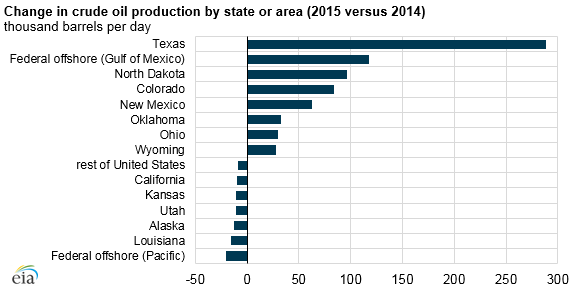 Production in Texas grew by 289,000 b/d in 2015, the largest increase of any state. The Federal offshore region of the Gulf of Mexico was second in both absolute level and 2015 increase, growing by 118,000 b/d to reach 1.52 million b/d, the highest production in that area since 2010. Production in North Dakota was third in both absolute level and 2015 increase, growing by 96,000 b/d to reach 1.18 million b/d, the highest on record for the state. California production has generally declined since 1985—when it was 1.08 million b/d—and averaged 0.55 million b/d in 2015. Alaska’s crude oil production, almost all of which is in the North Slope, fell for the thirteenth consecutive year, declining to 0.48 million b/d in 2015.